Ossobuco: Ossobuco is a Milanese speciality of cross-cut veal shanks braised with vegetables, white wine and broth. Ossobuco or osso buco is Italian for “bone with a hole”; a reference to the marrow hole at the centre of the cross-cut veal shank. It is often garnished with gremolata and traditionally served with risotto alla milanese. 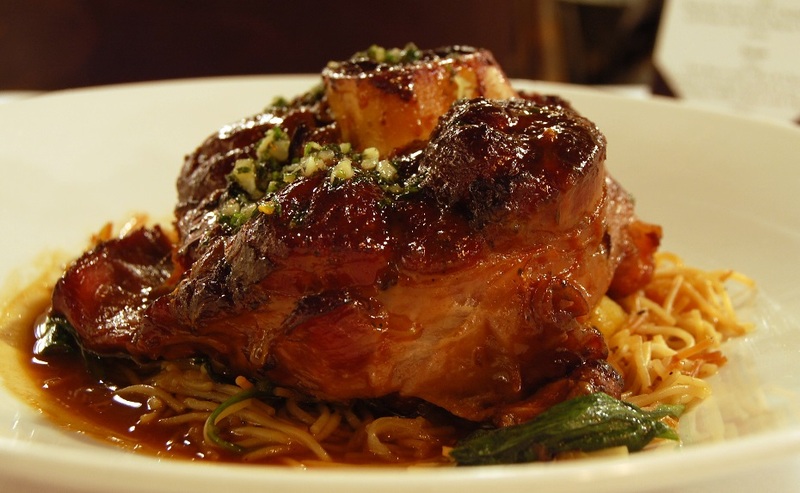 There are two types of ossobuco: a modern version that has tomatoes and the original version which does not. Lay the veal shanks in a shallow baking pan and sprinkle liberally on both sides with salt. Refrigerate for 2 hours. Rinse the veal shanks of their salt and pat dry with paper towels. Wrap each veal shank once around the circumference so that it holds the bone and meat together in the center. Tie the twine with a good knot. Season the veal shanks with pepper. Heat a large, ovenproof casserole over high heat. Put the oil into the casserole and let it heat. Meanwhile, put the flour in a shallow bowl, dredge the veal shanks in it, and pat off the excess. Brown the veal shanks in the hot oil for about 5 minutes on each side, or until browned on all sides. Remove from the pan and set aside. If the oil turns dark during the process, discard it and heat a fresh cup of oil. Add the carrots, celery, onion, and garlic to the pan and cook over medium-high heat for 2 to 3 minutes, stirring constantly. Add the wine, bring to a boil, and cook for about 2 minutes, or until reduced by half. Add the stocks, tomatoes, thyme, rosemary, and bay leaf to the pan. Return the veal shanks to the pan and bring to a boil over high heat. Once the liquid boils, cover, transfer to the oven, and cook for 2 1/2 hours, until the meat is fork tender and falling off the bones. Remove the herbs from the braising liquid and discard. Let the veal shanks come to room temperature in the braising liquid. Remove the veal shanks and set aside. Strain the liquid through a fine-mesh sieve or chinois into a large saucepan. Bring to a boil over medium-high heat, reduce the heat, and simmer for 10 to 15 minutes, or until reduced by a quarter. Using a skimmer or large spoon, skim off any grease or foam that rises to the surface. Return the strained vegetables to the liquid and taste for seasoning. Garnish each ossobuco with the fresh horseradish, lemon zest, and chopped parsley and season with pepper. Note: If you cannot find fresh horseradish, you can use prepared. It will taste stronger, so it’s a good idea to wrap the horseradish in a double thickness of cheesecloth and squeeze out the excess liquid.